Beautiful. Simply beautiful. Be prepared for full-on gushing love to pour out of me concerning this wonderful book. Thank you very much to Highbridge Audio and Audiobook Jukebox for the absolute pleasure of listening to Above Us Only Sky. Cassandra Campbell once again proves her excellence in narration. I read Michele Young-Stone’s debut, The Handbook for Lightning Strike Survivors and absolutely loved it. What I noted about it (and seems to have been done prior to joining up with my fellow Literary Hoarders to write reviews, therefore no written review is here for it) was the wonderful characters. They were a sad and tragic bunch of characters but they were still a joy to read about. So when I saw that Young-Stone had a new novel published, I quickly requested it, not really bothering to read too much of the premise of the story. But, oh this story. Oh, these characters. Oh, the stories each of these characters share. My heart is still aching. When I read Geraldine Brooks’, People of the Book, I marvelled at the incredible imagination she used to bring the journey/story of the Sarajevo Haggadah to life. Here, in Above Us Only Sky, I felt the same awe and wonder. Every character’s story is stunning in its beauty, the writing is divine, and all the sadness, all the horrors that were witnessed by so many and to also read of their triumphant stories of survival. I’m most in awe of Young-Stone’s imagination, like I was for Brooks’, in creating these highly emotional lives of those in this novel. 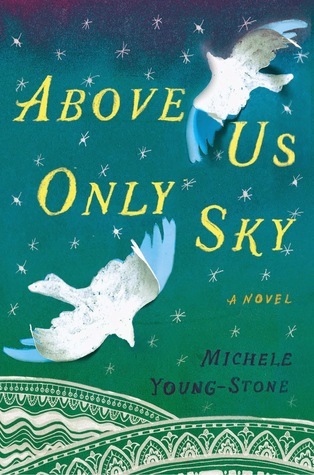 Above Us Only Sky is a deeply moving experience and Cassandra Campbell’s narration brings it to a level of the divine. A fantastic narrator for this stunning story. There is just a wee hint of magical realism inside as well, but the journey and the stories of the characters in Prudence’s family….simply stunning and gorgeously written about. I’m not going to share too much about the plot/storyline – I simply cannot do the incredibly awesome story the true justice – just please, read it. You will most certainly not be sorry. It will become one of the best books you will have read this year. It will be one of the most moving experiences read about this year. I know for me this is the truth. Anyway….Prudence is born with wings. However, these wings are surgically removed when she is an infant, but that doesn’t stop her father from lovingly referring to her as “little bird”. And after her parents divorce very early on in Prudence’s life and she is whisked far away by her mother to Florida, she pines and aches for her father and this odd feeling of her wings moving beneath her clothes. When she is 16 years old, Prudence receives a phone call from her grandfather (her father’s father) proclaiming himself to be her Grandfather and to also proclaim, “You are Lithuanian”. From that moment on, we are taken on this amazing, spellbinding, incredible journey through “the Old Man’s” life, through Prudence’s grandmother’s life, her aunt’s life: a journey that will tell you of the remarkable bird-women, those born with wings like Prudence, and the story of Lithuania – it’s struggle, it’s fight for independence. At the heart of the story is the history of Lithuania, and the importance for Prudence impressed upon her by the Old Man of claiming this birthright. Also at its heart is the importance of family. Prudence’s grandparent’s amazing stories of survival and what they witnessed between the times of the Russian, German, back to Russian occupation are incredibly emotional and heartbreaking. I cannot say anything more. I will probably ruin it – I simply cannot adequately put into words how beautifully written this beautiful, beautiful story is. My heart is still shredded. This book deserves wide, wide, wide recognition and readership. Bravo Ms. Young-Stone. I cannot wait, indeed I will be impatiently awaiting your next novel. You truly have a gift and I cannot wait to revel in it once again. 5 stars for the stunning story and 5 stars for Campbell’s equally stunning narration. The audio CDs are now being shared among by my fellow Literary Hoarders. I know for certain this will be a Hoarder’s Triple Strike. It well earns the Literary Hoarder’s Approved badge. I honestly have this emptiness, a void now in my life. Sigh. Well, what can I say to that but that I will have to add it to my list. I also loved People of the Book, but haven’t read anything by this author. Enthusiastic review!